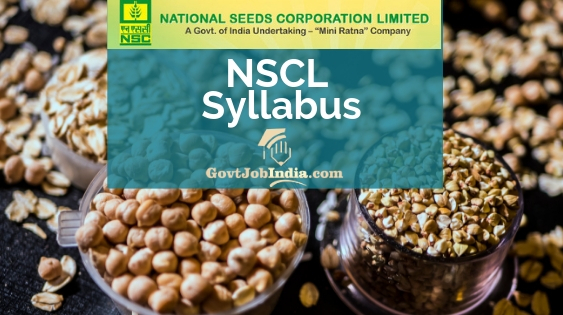 NSCL Syllabus 2019 PDF Download- All candidates who have applied for NSCL Recruitment are dully notified that the National Seed Corporation syllabus 2019 is out officially! The vacancy is for the posts of Deputy General Manager (DGM) (Vigilance), Assistant (Legal) Grade-I, Management Trainee, Senior Trainee, Diploma Trainee, Trainee and Trainee Mate and we have given the syllabus according to each of the posts. The selection procedure of each of the post differs, so we have also given tables which you can refer to. The syllabus is almost the same for each of the posts. Furthermore, you will find the detailed NSCL exam pattern as well here on our site. All those candidates who wish to download the National Seed Corporation Recruitment Exam Syllabus PDF can download it from the following sections. The NSC Recruitment was a vibrant opportunity for all aspiring individuals who wished to seek a govt job in such a prestigious organization of the country. Candidates can apply before the last date to apply online 09th February 2019. So, now that you have gathered all the vital information about the NSC Syllabus, we will proceed with the recruitment details. Assistant (Legal) Gd. I Written exam written examination OR written examination and Skill test(s) in case of Trainee (Stenographer), Documents and Certificate Verification. • Problems on H.C.F and L.C.M. • Active Voice and Passive Voice. • Error Correction (Underlined Part). • Error Correction (Phrase in Bold). • Operating Systems.The hardware of the Computer. We hope that you will surely get selected for the great opportunity provided by the National Seeds Corporation Limited which is the NSCL Management Trainee Recruitment 2019. Comment below if you have any doubts related to the NSCL Syllabus and Exam Pattern PDF Download and our Team will get back to you as soon as possible. In the end, make sure to subscribe to our website @GovtJobIndia.com for latest updates about the recruitment across the country.